Only two teams appeared properly prepared for the 1979 season, Project Four and Team Tiga with drivers Chico Serra and Andrea de Cesaris. It would be Serra's consistency that saw him take the title after an number of avoidable accidents and mistakes dropped De Cesaris from contention. 18-year-old Mike Thackwell was also very consistent and won four of the last eight races in his works March. With honours divided, British F3's run of projecting its champion straight into F1 stopped with Serra. The Brazilian progressed instead to F2 with the Project Four team, moving into F1 a year later with Fittipaldi. Ironically this was the first time there was a single British championship, the BARC and BRDC championships having merged for 1979. 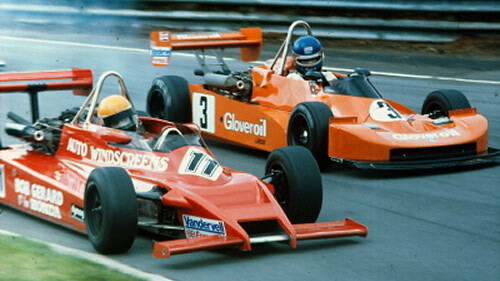 Ground effect reached F3 in 1979 but none of the constructors could easily adapt the new technology to production cars. The March 793 'pod' car was basically a 783 with wing-profile sidepods and flexible - or sometimes sliding - skirts, but the narrow 783 tub lent itself well to this adaptation, and the 793 won all but one race in Britain. March also built a 79C, a F3 version of the 792, but testing proved it was not competitive. The overweight Chevron B47 was also a wing-car version of a 1978 car but in this case the sidepods were too narrow to be effective and it managed just one wet-weather win. After dominating 1978, Ralt almost vanished from F3 in 1979 as their prospective customers waited in vain for the new ground-effect RT3 to become available. A scaled-down version of the F2 RT2 design, the car showed promise in testing. The Argo JM3 also proved quick on occasions and it was these two designs that looked best placed to challenge March in 1980. This series ran over 20 rounds and used a 9-6-4 points system with an extra 2 points awarded for fastest lap. Points tables from Autosport 22 November 1979 p22 and Autocourse 1979/80 p231. The Novamotor-built Toyota engine won all but two of the F3 races held in Britain in 1978 with the Triumph engine, now prepared by Swindon Race Engines, taking the other two. A Titan-built Chevrolet Vega also appeared in Britain, Renault-Gordini and BMW engines were used extensively in France and Germany respectively, and a Novamotor-built Alfa Romeo unit won in Italy. Speiss's Audi/VW engine was a disappointment.. The 1979 results have been compiled by Chris Townsend using the main British magazines Autosport and Motoring News plus organisers' results sheets and practice times, and annotated programmes where available. Race and qualifying results are largely complete but we still need full results for Silverstone 4 Mar 1979, Silverstone 25 Mar 1979, Snetterton 1 Apr 1979, Brands Hatch 7 May 1979, Silverstone 28 May 1979, Brands Hatch 10 Jun 1979, Cadwell Park 17 Jun 1979, Silverstone 14 Jul 1979, Donington Park 15 Jul 1979, Silverstone 27 Aug 1979, Oulton Park 15 Sep 1979 and the final Thruxton on 3 Nov 1979. Additionally, entry numbers are not known for Silverstone 1 Jul 1979, Silverstone 14 Jul 1979, Mallory Park 12 Aug 1979, the Leinster Trophy at Mondello Park 2 Sep 1979, Thruxton 30 Sep 1979, Thruxton 28 Oct 1979 and the final Thruxton on 3 Nov 1979. Chevron, March and Ralt chassis records allow a lot of the cars of this period to be identified and it was common for Autosport and Motoring News race reports to mention former owners of second-hand cars. Autosport adverts as well as its 'Pit & Paddock' and 'Sports Extra' sections add further information on car movements. And finally, we are still none the wiser to the true name of the pseudonymed "Frank Marvel" at the Cadwell race.